There are 14 Assisted Living Facilities in the Bountiful area, with 9 in Bountiful and 5 nearby. The average cost of assisted living in Bountiful is $2,840 per month. This is lower than the national median of $3,346. To help you with your search, browse the 93 reviews below for assisted living facilities in Bountiful. On average, consumers rate assisted living in Bountiful 4.4 out of 5 stars. Better rated regions include Farmington with an average rating of 4.5 out of 5 stars. Caring.com has helped thousands of families find high-quality senior care. To speak with one of our Family Advisors about assisted living options and costs in Bountiful, call (855) 863-8283. Ranked one of Utah's top five fiscally conservative cities by the Utah Taxpayers Association, Bountiful offers scenic mountain views, locally owned shops on Main Street and the annual Handcart Days celebration for Pioneer Day. Approximately 42,500 people reside in this scenic city, and thousands of men and women over the age of 65 call Bountiful home. Bountiful seniors who value independence but want light help with daily tasks can choose from 35 assisted living facilities in the area, all of which are regulated by the Health Facility Licensing, Certification and Resident Assessment. This bureau monitors the actions of assisted living facilities throughout Utah, including those located in Bountiful, so seniors receive quality care in their communities. Enjoy clear glimpses of the mountains and forests surrounding Bountiful from early June to late October, when skies are typically less overcast than the rest of the year. The sun shines up to 15 hours per day in June, providing ample time for gardening, bird watching and leisurely strolls through local parks. Throughout the year, Bountiful's average temperatures range from 23 degrees Fahrenheit to 92 degrees Fahrenheit. Seniors without personal transportation explore Bountiful and surrounding cities via UTA buses. Reduced rates are available for one-way, roundtrip and monthly passes, but daily passes do not offer special rates for seniors. The Bountiful area is home to world-class medical facilities, including Lakeview Hospital and South Davis Community Hospital, in the event of medical emergencies or illness. Residents of Bountiful, Utah, pay slightly more than the national average for some basic necessities. Bountiful's cost of living is 106.1, while Utah's average is 104 and the U.S. average is 100. However, higher-than-average housing costs are primarily responsible for Bountiful's cost of living score, as residents pay less for health care services, groceries, transportation and utilities than other parts of the nation. Bountiful is safer than four out of 10 U.S. cities. Utah's overall rate for violent crimes is more than twice as high as Bountiful's rate, and Bountiful averages just one murder and two robberies per year. Air quality in Bountiful, Utah, is better than the national average. On a scale of 1 to 100, the U.S. holds a 58 for air quality, while Bountiful has a 74. Assisted Living costs in Bountiful start around $2,840 per month on average, while the nationwide average cost of assisted living is $4,000 per month, according to the latest figures from Genworth’s Cost of Care Survey. It’s important to note that assisted living rates in Bountiful and the surrounding suburbs can vary widely based on factors such as location, the level of care needed, apartment size and the types of amenities offered at each community. 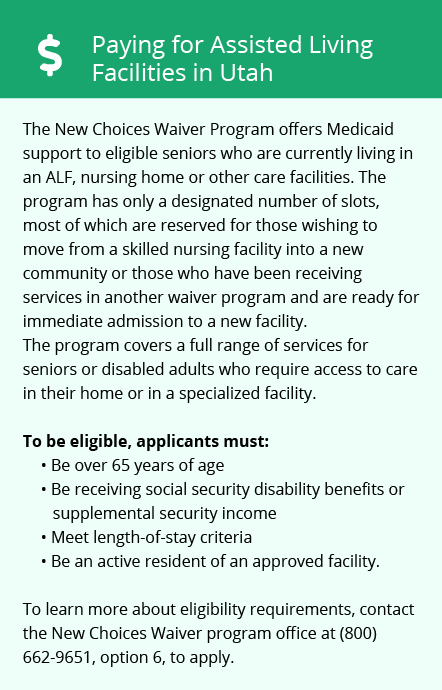 Seniors who receive Medicaid or qualify for the state-managed healthcare program have two options for financial assistance: the New Choices Waiver and the Aging Waiver for Individuals Age 65 or Older. Seniors must meet income limits and asset restrictions as well as show a need for assisted care. Bountiful and the surrounding area are home to numerous government agencies and non-profit organizations offering help for seniors searching for or currently residing in an assisted living community. These organizations can also provide assistance in a number of other eldercare services such as geriatric care management, elder law advice, estate planning, finding home care and health and wellness programs. To see a list of free assisted living resources in Bountiful, please visit our Assisted Living in Utah page. 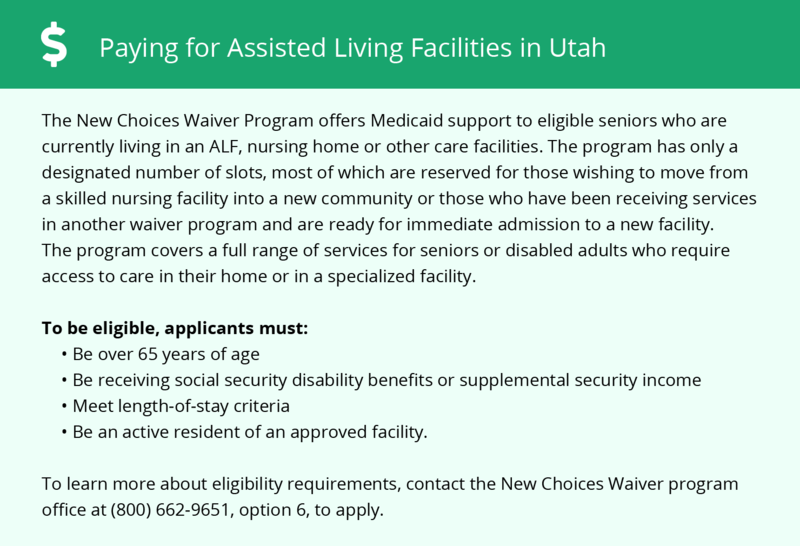 Bountiful-area assisted living communities must adhere to the comprehensive set of state laws and regulations that all assisted living communities in Utah are required to follow. Visit our Assisted Living in Utah page for more information about these laws.